Lapu-lapu or grouper is common in the Philippine wet market and the varieties of colors ranges from spotted red, red-orange, brown and gray with black spots. Although this is not rare, the only restriction from buying this fish is the price. It is expensive compared to other fishes sold in the market. 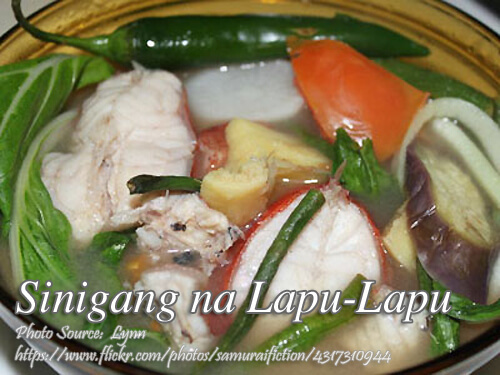 However you can try this sinigang na lapu-lapu recipe using tamarind juice to make a sour broth on some occasions or if you are just wondering what will a lapu-lapu with it’s white, flaky, and delicious meat would taste like in a sour tamarind based broth. Clean the lapu-lapu by removing the gills and internal organs. Wash in running water and slice into 1 to 2 inches wide. In a large pot pour 6 to 8 cups water and bring to a boil then add onions, tomatoes and tamarind juice (or sinigang mix) and simmer for at least 3 to 5 minutes. Then add the fish and let it simmer again for another 8 to 10 minutes or until the fish is already cooked. Season with salt or patis. You can add some magic sarap, namnam or any other granulated seasonings in the market. Then add the all the vegetables and green chili then cook for 2 to 3 minutes. Serve hot with fish sauce, kalamansi and red chili for dipping.